From folk to world bass to a country barn dance, only in New Brunswick would one find such an eclectic and strangely complementary line up. And only in New Brunswick will such a line up be connected to fermenting food, growing food forests, and learning about excavators. 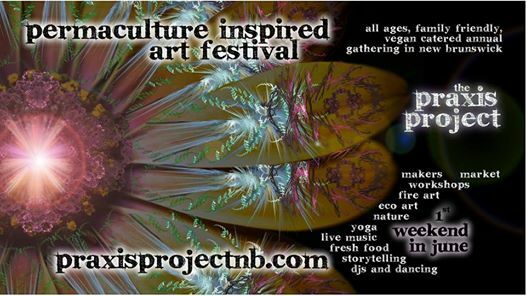 The Praxis Project Permaculture Festival June 2-4 in Knowlesville, NB announced on Earth Day that the Friday June 2nd line up features Earthbound Trio and beatbox poet Blank Space. On Saturday June 3, fresh from mixing and fire-spinning for adoring crowds in Goa, Halifax’s Nausikaa and Wobble Wallah bring their circus-inspired approach to electronic music and performance. MKW brings a DJ set to round out the roster. On Sunday June 4, Knowlesville, cherished local musicians and community members present a Country Dance early in the evening. The Festival is an intimate annual transformational gathering taking place each June for the next 5 years. Nestled in the foothills of the Appalachian range, the 3 full days of programming includes music, in-depth skill-building workshops, and permaculture-inspired curriculum. The site becomes a permaculture living lab June 2 – 4th. Art installations by Ontario artist Patrick Connor and other celebrations of life characterize the Collective’s intentions for this multi-year effort. “The Praxis Project is an opportunity to learn and transform that is both personal and cultural, fuelled by healthy food and meaningful conversation.” explains Founder and Collective Member Alex Murray. “We are offering the opportunity for participants to connect deeply with the natural world and with the friends they haven’t met yet”. Each year, workshop participants can return to the land and watch the progress of a budding food forest they helped create. A first of its kind in New Brunswick, the cost of a ticket includes an annual membership to the Praxis Project, and a fully catered 3 days of delicious, healthy vegetarian / vegan meals created with locally grown ingredients and on-site camping. Membership gives access to workshop options including building skills in heavy machinery, permaculture, mycelium, fermentation, and yoga in addition to the evening programming announced on Earth Day. This is a syndicated post. You can view the original post here: East Coast Favourites Earthbound Trio, Nausikaa and Wobble Wallah to play New Brunswick Permaculture Festival June 2-4.